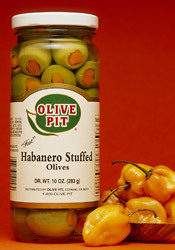 Hot Hot Hot - Habanero Stuffed Olives make this pasta sauce sizzle! Rinse olives, drain and use paper towels to squeeze out extra moisture. Combine olives, celery and leaves, oil, red onion, parsley, garlic and pepper in a bowl. Toss hot pasta with sauce and serve warm. This dish serves 2 people. Simply delicious!